Tropical Depression Six formed over the Gulf of Mexico early Monday morning. The tropical storm that barrelled through the Tampa Bay area Monday was downgraded to a tropical depression, the National Weather Service said. Emily made landfall on Anna Maria Island on Monday morning and brought a deluge to Tampa Bay, with more than 8 inches of rainfall in Valrico over the last 48 hours and nearly 6 inches in St. Petersburg. The storm left two brothers stranded in Tampa Bay, clinging to a range light, after the heavy rains sank their 17-foot boat around 9:45 a.m. The Coast Guard saved the Tampa men — Tung Le, 47, and Thanh Le, 41 — who were fishing Monday morning when their engine died and the storm overtook them. The brothers were taken to a hospital shortly after 10 a.m. with no reported injuries. Gusty winds and heavy rain also forced the closure of the Sunshine Skyway Bridge, which reopened around 2:20 p.m. The storm had maximum sustained winds of 45 mph as it passed over Manatee County around 10:45 a.m., according to the National Weather Service. The Tampa Bay region was under a tropical storm warning — which stretched from the Anclote River near Tarpon Springs to the south to Englewood in Charlotte and Sarasota counties — as the system moved onshore near Manatee County, bringing showers, storms and potentially heavy rainfall. The warning for that area was lifted as of 2 p.m.
A flood watch also is in effect for much of the region – including Pinellas, Hillsborough, Hardee, Highlands, Manatee and Sarasota counties – through Monday evening, according to the National Weather Service. Some areas could see as much as 6 inches of rain over the next 36 hours, 10Weather WTSP meteorologist Grant Gilmore said. Tampa Bay residents can expect some lightning and thunder, Gilmore said, but the biggest threat is the buckets of rain the system is bringing, which will result in localized flooding. Click here to track the storm. "Standing water on roadways will also be a concern which could result in hazardous travel," Gilmore said. "Make sure to give yourself extra time when out on the roads." Tampa Bay should see the worst of the storm on Monday, though pockets of heavy rainfall are expected to continue sporadically throughout the week, forecasters said. Tampa International Airport reported 61 delays and two flight cancellations as of about 3:20 p.m. Monday. Airport officials had activated their incident command center earlier in the day but deactivated it Monday afternoon. Still, said airport Communications Manager Danny Valentine, "We're continuing to remain vigilant and monitor the storm." It's difficult to forecast how the storm will impact the airport in the coming days, Valentine said. "As always," he said, "the best advice for passengers is to check with their airline before coming to the airport." The rain begins to let up overnight as the storm tracks farther east before completely moving out of the area by midweek, Gilmore said. Widespread showers will remain likely until then, possibly amounting to somewhere between 3 to 6 inches by Thursday, Gilmore said — with some areas possibly seeing even more. 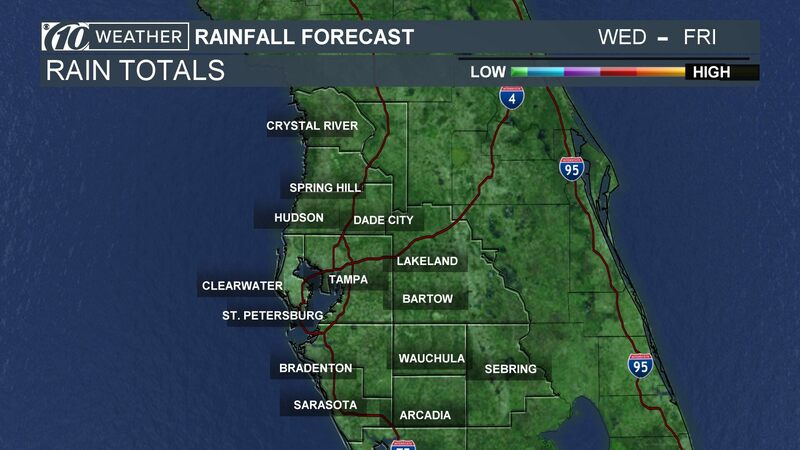 Aside from the rain on Monday, temperatures will still reach the upper 80s under mostly cloudy skies, Gilmore said.